This Mothers’ Day I received one of my loveliest commissions to date. I was given the task of designing a cake for four mothers who would be celebrating Mothering Sunday together. The mother who commissioned it was my lovely customer and fellow blogger Catherine Hayes Sparks (Mum of Invention), and among her party was her daughter who was celebrating her very first Mothers’ Day. My remit was simple; they asked that the texture of the cake be crunchy rather than creamy, and told me that they love citrus and ginger, but that other than that they trusted me to surprise them. These are the things that make my job so enjoyable – a cake is a symbol and centrepiece of a celebration and to be honoured with the task of creating it is something that never ceases to thrill me. It was the perfect opportunity to showcase the amazing citrus fruits that are briefly in season in late winter – bergamot and blood oranges. 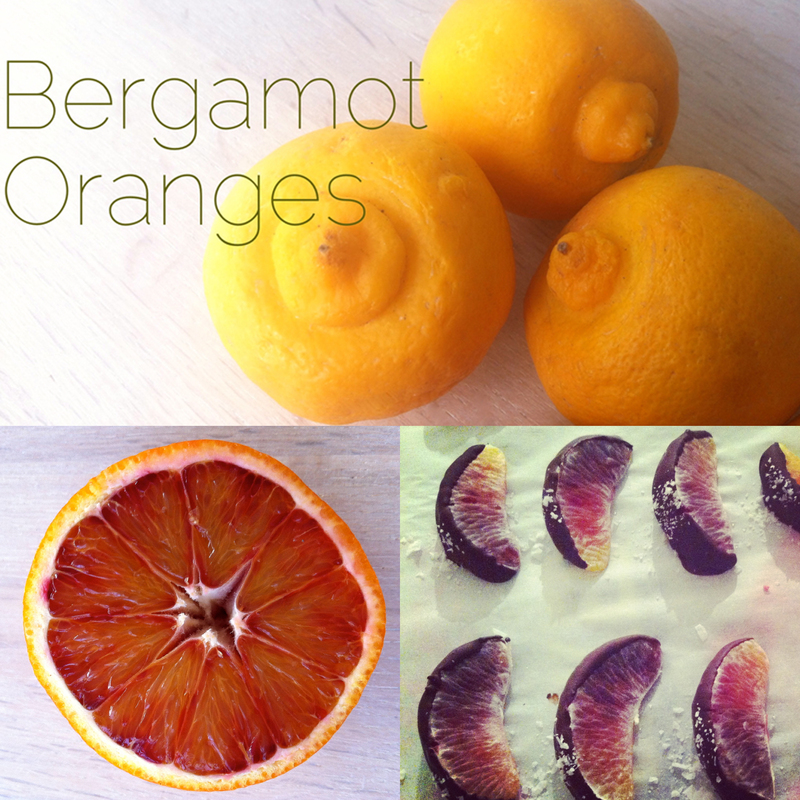 Bergamot oranges are used to infuse Earl Grey tea, and their flavour is delicate and refined. Blood oranges are a marvel of nature, their colour is audacious and defiant – a riotous coalescence of pink and orange and a damask juice that dazzles the senses. The vivacity of the winter citrus fruits counterpoised perfectly with the sultriness of the stem ginger, and both flavours could be anchored with a base of bitter chocolate. 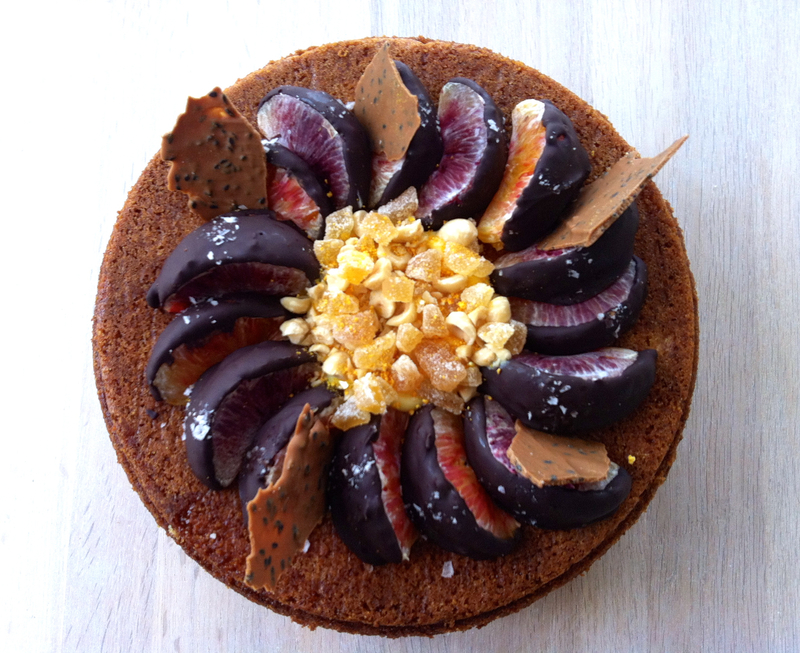 I achieved the crunchy texture by making the cake with radiant yellow polenta, crunchy hazelnuts, dehydrated orange zest powder and shards of roasted white chocolate brittle with black sesame seeds. It was a cake that symbolized celebration – of the seasons, of the senses, and of motherhood. As always truly amazing and brilliant. You are genius at delivering joy. Simply amazing!